GE SmartHome Indoor Outlet Receiver. Welcome to the future. Now you can enjoy the security, safety and convenience of GE SmartHome technology without expensive rewiring or professional installation. Inexpensive and easy to set up, GE SmartHome technology allows you to control home lighting and appliances wirelessly. Imagine the nervous feeling of coming home at night to a dark house. Now imagine the secure feeling of being able to turn on indoor and outdoor lights while still 100 feet away from your house. Or imagine the safety of turning on a light in a dark basement with the touch of a button- while still at the top of the stairs. Or the convenience of starting to brew your morning coffee- while still in bed! GE SmartHome products allow homeowners to control lights and appliances with RF (radio frequency) signals. There are two types of products- transmitters and receivers. At least one of each is required to create a SmartHome system, but one transmitter can be used with several receivers. 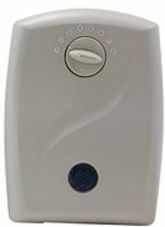 The transmitter (functions as a remote control) sends the RF signal to the receiver (which is plugged into an outlet and the appliance is plugged into this receiver). The receiver then turns on the appliance. Both the transmitters and receivers have a dial with eight different positions that allows the homeowner to control up to eight appliances with one transmitter. All eight appliances can be turned on at the same time or they can be turned on individually. For example, lights on the front porch can be set on channel 1, lights inside on channel 2, and the coffee pot on channel 3. With just the turn of a dial the transmitter can be set to channel 3, to turn on the coffee, and none of the lights will be affected. If you wanted all three appliances to turn on at the same time you could set them all to the same channel.